With the final season of Voltron: Legendary Defender set to premiere on Netflix this December, there’s never been a better time to get into the show. If you’ve been hesitant about the IP’s recent reboot because it was fronted by a Western animation studio, or because Voltron has had a track record of fumbling their way through contextual revival over the years then fear not—the Dreamworks rendition of this 80s action figure anime is back and better than ever before. Originally produced by Toei Animation back in 1981 as Beast King GoLion, the show’s footage was chopped and screwed and ultimately repacked (in a somewhat similar fashion as Power Rangers) for American audiences as Voltron: Defender of the Universe several years later. Since then, the show has fallen prey to a series of haphazardly reboots and remakes. The most recent Netflix revision, however, is brought to us by Dreamworks (of Shrek fame) with billed show runners having previously worked together on the highly praised Avatar: The Last Airbender. Suffice to say, the talent has once again delivered the goods with Voltron. 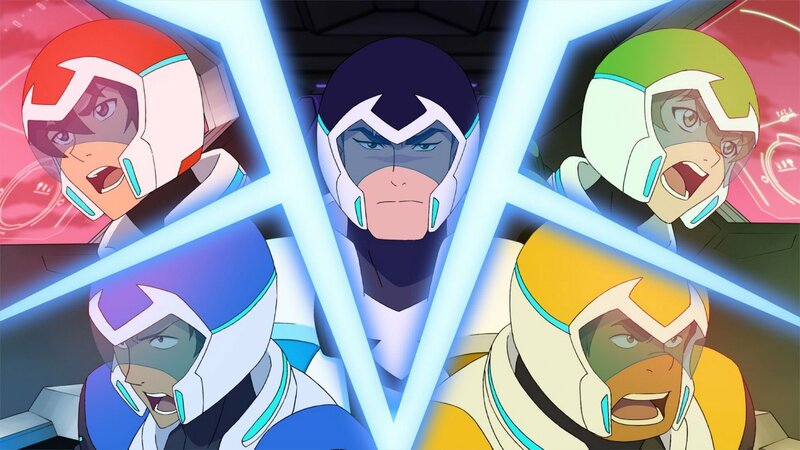 Conceptually, Voltron isn’t without its share of narrative hurdles—especially so when one considers the fact that the show’s protagonist is actually like five or six different characters that have to function both together and independently of the team at large. Their challenges and hopes and dreams need to get articulated and explored without sacrificing the action one would expect of something with the subtitle Legendary Defender. Picking up the pieces of a 40 something year old IP, the Dreamworks team has their work cut out for them: the show can’t simply be a series of 20 minute space fights designed to sell children cheap plastic toys, but it also can’t be this high-key lore dump to make up for all the years of on and off storytelling. It’s hard enough to get people to care about characters without all the additional baggage. But the show leans into these challenges gracefully with a holistic approach: taking the gimmicky concepts laid out by its’ predecessors and building from there to push the drama forward, rather than excuse themselves as being tied down by it. The cast of Voltron, and their development as characters, feels organic, allowing the story to flow with them instead of around them. Their existence in relation to the overarching narrative is nebulous, drifting from arc to arc, qualities and attributes and anecdotes glomming on as they pass through orbit—overly lengthy exposition is sidelined in lieu of the adventure itself. Voltron pushes a narrative of discovery, allowing us to more naturally learn about the cast as they learn about each other, themselves, and the surrounding universe(s). In a genre that has, as of late, come to take itself far too seriously, Voltron manages to strike a tone that indicates high stakes while simultaneously undercutting that gravity with a much welcomed levity. Even during some of the more dramatic story beats, humour is never found too far out of frame—and it’s this charming quality that allows Voltron to outshine the likes of its’ more self-serious genre-mates. Voltron develops its increasing ambition cautiously—careful to never overstep itself in regard to such things as tone or decorum. The fate of the paladins always seems to be squarely set in its own committed reality with a reassuring feeling that the narrative has taken itself (and you) seriously, even if the animation sometimes doesn’t. Good art, good media, doesn’t need to be grand. It can be a quiet tour de force that proves itself through well-conceived world building and storytelling. Wether it’s an artful drama, a slice of life, or a beach episode—good ideas properly executed can make for amazing media. If you’re looking to mainline some other must watch anime, check out Brandon’s case for Megalo Box.